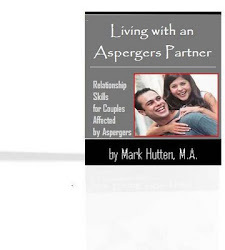 My husband has Asperger’s. It's stressful and I'm exhausted. The 'support' groups I’ve joined basically say the same thing: 'It's not his fault, accept him for who he is.' He’s selfish, rude, and throws tantrums like a 3 year old to get his way. I feel like I’m raising a second child that will never grow up. I am worn out, sad, and lonely. I feel I’m losing my 'self' through all of this and I just don’t have any strength left to fight. I'm the one that has to handle everything, and there is never someone there to help me. I have pushed aside my friends when it comes to social gatherings because my husband always seems so disengaged at these events. He denies that anything is wrong and won’t seek help. An outsider looking in would see a man who is very smart, but emotionally flat. The outsider would probably feel sorry for him for having a fat, angry and horrified wife -- and have no idea that when she married him, she was pretty, healthy, funny and cheerful. He took all of these things from me. When at home, he is a 'cold fish' and seems resentful if family needs his help. As he has gotten older, he is more controlling. He rarely shows compassion for us, while claiming we are the center of his world. I didn't realize what was happening to me because I loved him. It was like a slow leak that you don’t recognize until it is too late. I have blamed myself for everything – every blow up, every sigh he generates, every look of disgust, the fact we are not sexual or even affectionate. The fact he doesn’t 'get it' makes it all the more head-banging frustrating. I just started taking anxiety medication. I am literally going crazy. I'm so sick of hearing, ‘He can’t help it. He's unaware of it. He's wired different. Have more understanding. Imagine what it is like to be him.' I guess I'm a terrible wife for not being more understanding. I have Asphergers. About 3 monthes ago me and my wife started to go to neurofeedback. I needed it to understand myself and my wife's frustrations with me. My wife used it to her anxiety and OCD. After 30 sessions we started to see deference. I stoped beeing as extreme with my thoughts as I was. Now I am able to understand when I am extrim and that I should look for middle ground. I understand my emotions a bit better. I was surprised but I also become more affectionate. after her 30 sessions. she is controlling her anger and her anxiety almost gone. This! And I am so sorry you live this too. Two things... why describe yourself as "neurotypical" wife? These things happen to aspie wifes of aspie men too. The only difference between NT wives of aspie men and AS wives of aspie men, is everytime someone says that garbage about "they can't help it" etc, not only are they making excuses for our husbands to treat us poorly, but they are insulting who we are with their garbage stereotypes of people with autism. Secondly, while it doesn't make any of the awful way he treats you okay, at least reassure yourself - it could be worse. My now-ex husband violently physically abused my daughters and I before we separated, and the things he has (and continues to do) since we separated is far worse than just the simple assaults we used to have to put up with. no one said this was the worst trauma. This is simply her experience as an NT wife. An aspie wife can go and blog about her journey to resonate with other aspie wives of aspies. But this is her journey.. Everyone is entitled to their thoughts. Erm I think Lemming was supporting her,....no questioning, just pointing out in a considerate way to help eleiviate burden. Ie. Also not agreeing with the excuse of husband given by others, as just because asd, doesn't mean can't take some responsibility and work together as a couple to bring on positive change.